John Collier was a highly influential portraitist of his generation, known for his attention to detail and sombre, atmospheric colour palette. 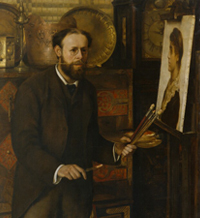 About the artist: John Collier (1850 – 1934) was a highly influential English artist and author. He painted in the Pre-Raphaelite style with a focus on attention to detail. His paintings mainly feature women in grand surroundings, but he is most famously known for painting Charles Darwin. The portrait sees him facing the observer in the loose cloak familiar to those who knew him, and with his beloved slouch hat in his hand. Collier’s range of portrait subjects was broad. His commissioned portraits of the Duke of York (later George V) as Master of Trinity House in 1901, and the Prince of Wales (later Edward VIII) were his major royal portraits. Collier’s entry in the Dictionary of National Biography compares his work to that of Frank Holl, due to its stillness and solemnity.